On Saturday hubby and I drove west to Charters Towers. It's a beautiful small country town about 160 klm away and it's where we called home from 2009-2011, living in a lovely old cottage that captured my heart. We go back to visit every couple of months and as the giant water tank on top of Towers Hill comes into view about 10 klm out of town my heart always skips a beat because it feels like coming home and I tend to become a wee bit emotional about that. First stop is always, without exception, the local newsagent. They stock all my favourite English country magazines and many craft magazines from overseas that I cannot find in the big city. The week following our Charters Towers visit has me enjoying many long afternoon teas and I'm sure you understand why. We don't visit people while we're there, we come to visit the town itself. Quite simply the atmosphere, the peace of country life, the simplicity and 'slowing' that cloaks the town draws us in as we wander up and down Gill Street (for in all tiny towns there is but one main street, yes?) and scan the Houses For Sale ads displayed across the various estate agent windows. We dream, hope, pray. After all, you never know, a teaching position may open up there again one day for my darling man and we could set down deep roots at last in a town we love. I slip into my favourite charity shops to see what treasures can be found and inevitably come out with at least a few vintage buttons and a book or two. There's also a gorgeous gift shop with so many pretty things under one roof that a number of birthday gifts are usually purchased in advance for shabby chic loving friends or family. Coffee and cake (or a hearty breakfast if we've come early in the morning) is enjoyed at Henry's Restaurant next to the cinema before a final stroll back to the car, and then it's a slow drive around the streets, looking at the beautiful old homes, enjoying expansive views from the hill and ending with a drive past one particular home we've had our eye on since 2009 - always hopeful a 'for sale' sign will one day appear out front when the time is right. We don't talk much during the 90 minute trip back home, each of us in our own thoughts...but that evening we share our dreams about life, the future, and perhaps that town. Have you lived somewhere that stole your heart and never gave it back? During the three hour round trip to Charters Towers I sewed one inch hexies on my lap as Mr E drove. When we go away on long road trips I take embroidery, and next weekend we're off on one of those much longer trips which is why this shorter drive was a good test to see if sewing hexies would be more relaxing during the journey, and it is. 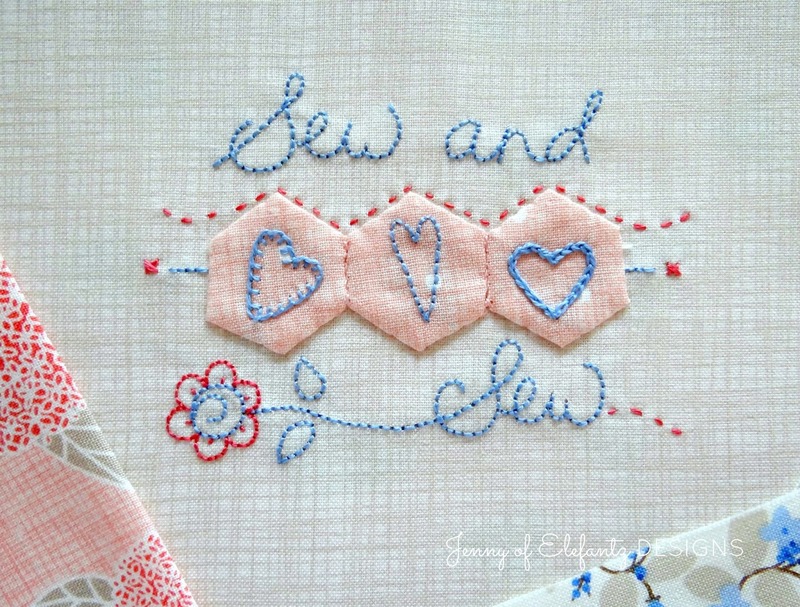 In fact I enjoyed making them so much that I continued sewing hexies that night while we watched an old movie. Fortunately I'd prepared a lot of hexie fabrics whilst sorting through my scraps basket so I just kept going until I ran out. The next morning I prepared more and before we go away I shall add to them, just in case. 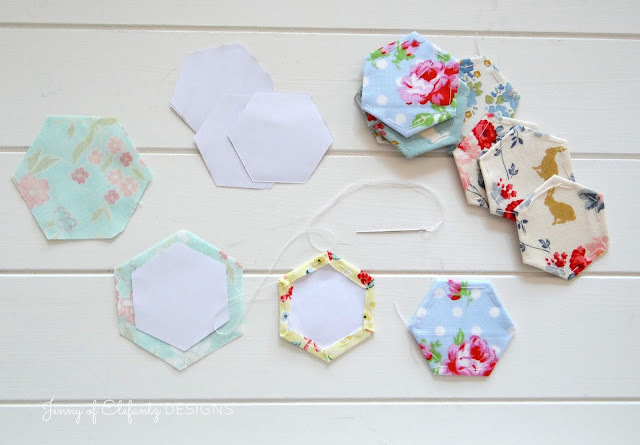 A few ladies have asked me to show how I make a hexie. Many blogs and designers have done tutorials on this so I won't go overboard with it, but here's a simple run through what I do. 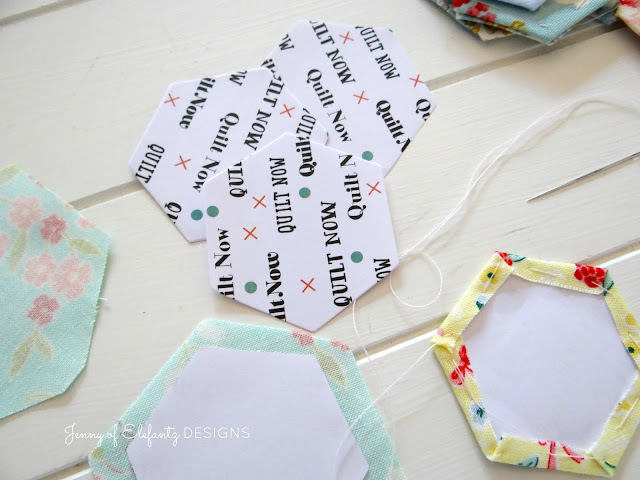 You need hexagon shaped paper templates and these can be purchased in packs from your local quilt shop, online, printed from the internet to cut out yourself, or even as occasional freebies with craft magazines. As we live fairly remote in the big scheme of things around Australia, unsold magazines are not sent back to publishing houses from here for cost reasons, so the newsagents resell them after their month of issue has expired for just a dollar or two. This is how I purchase most of my craft magazines, and most of the time there's free fabric, plastic templates, kits or paper templates attached. One of those $2 magazines had 250 one inch hexies included when I bought it last week, just in time for my trip! 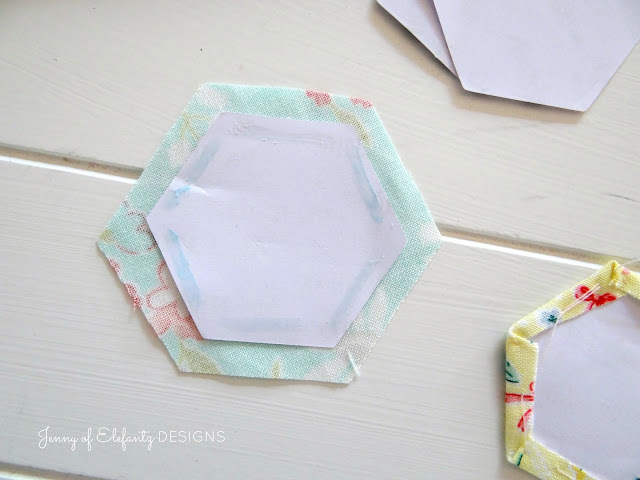 I have a plastic template for tracing the hexagon shape needed to make a 1" paper hexie (also from a $2 magazine) but I feel confident now to cut four at a time with scissors alone. I cut four squares of fabric large enough to give me a border around the paper shape and holding the paper and fabric together with one hand I use my super dooper Klasse shears to cut through the fabrics. The border is close to a 1/4" all around, but sometimes a little less when using smaller fabric scraps. 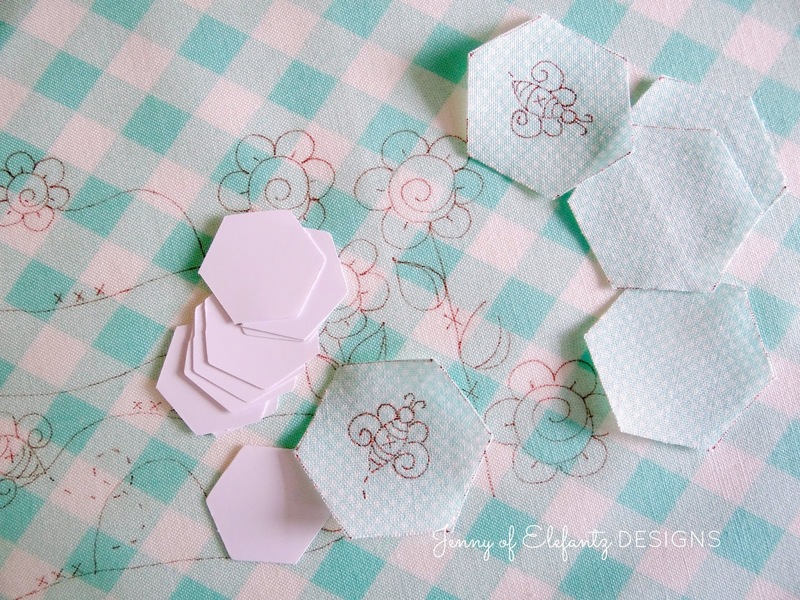 If you're not confident doing it my way use a proper hexie template sized to suit the hexie you want to make, or trace the hexie onto the wrong side of your fabric and draw a line 1/4" outside it for your cutting line. Cut along the line with scissors or a rotary cutter. There's two ways to fold the fabric around the paper hexie - hand stitching or glue. I hand baste because for me this is sooooo very relaxing. Folding one edge at a time around the paper you sew large basting stitches (running stitches) through the fabric and paper until you have done all six sides. No need to knot the thread, it will be removed later when you take out the papers. This is quick and easy, perfect for doing on your lap in the car or anywhere you're out and about. To use the glue method a glue pen is best. You only need enough to secure the fabric to the paper because you'll need to lift up the edges later and remove the papers. Press the fabric borders over onto the hexie paper with your fingers, one at a time. I'm a hand baster because it's very calming and I don't much like peeling glued fabric borders away from the paper later, but I have friends who love glue basting so do what makes you happy. My camera was whisked away to the camera shop this morning to be cleaned so I don't have photos of sewing the hexies together, but it's not hard. Press the hexies flat with a warm dry iron as this will give you a nice crisp edge, then hold two hexies right side together (still basted, still with paper inside) and sew along one side with a blind stitch. Sew as many together as you need and when you're done remove the basting stitches and the papers. 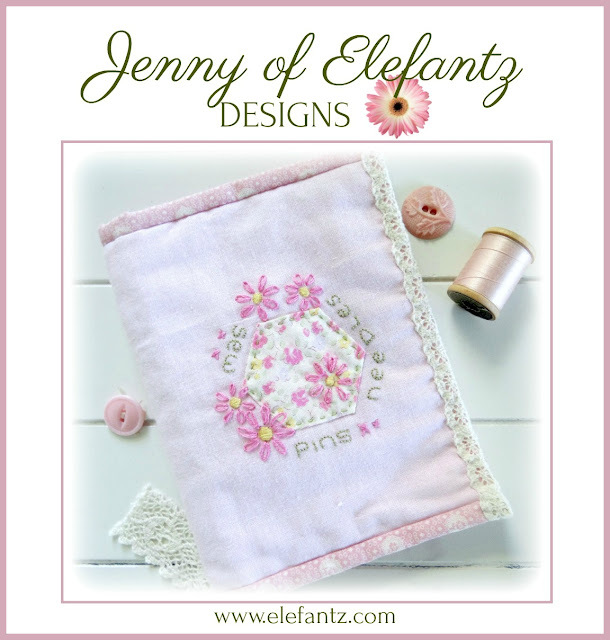 The embroidery is traced onto the hexie fabric shape first, then after the hexie is made it is sewn onto the design and embroidered. 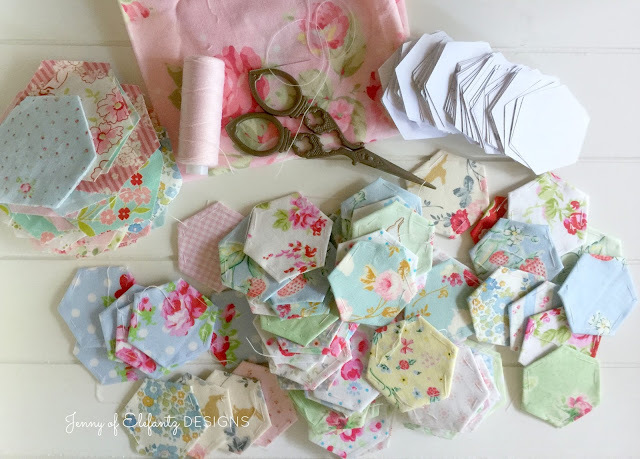 Hopefully this has helped those of you who haven't yet ventured into paper piecing, but remember, I'm no expert, just a girl who likes to make them as simply and calmly as possible with minimum effort for maximum effect. 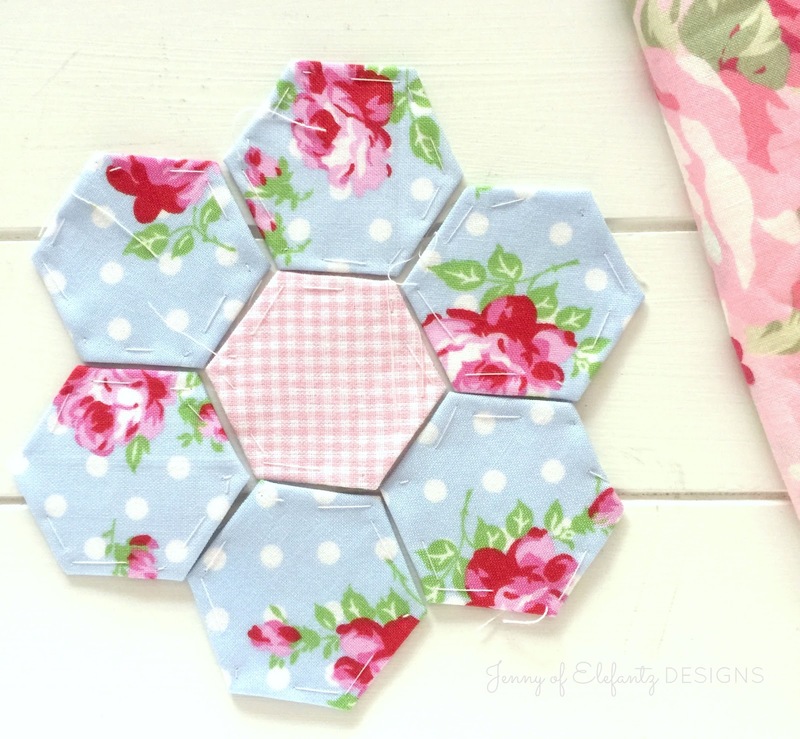 A few years ago I shared a free pattern and tutorial, The Hexie Flower Show". Perhaps you may like to practice with it? Download the free pattern here from my shop. I wonder whether you prefer stitch basting or glue basting? I agree with you, I enjoy passing traveling hours making up hexies. 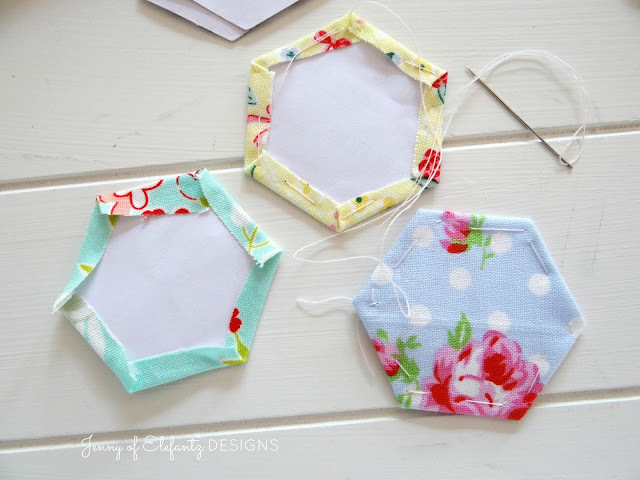 My current hexie project is using 3/4” hexies. I cut 2” squares and use a tiny binder clip or a Wonder clip to hold the first edge on the paper. I do not sew thru the paper, but sew two half-hitch knots at each corner as I work my way around all the sides. 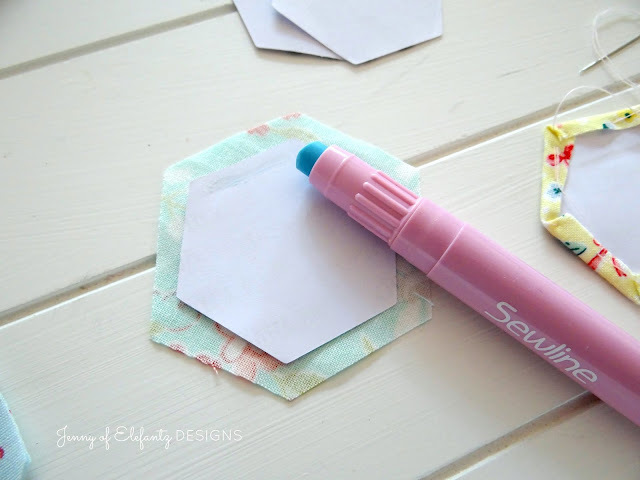 But first, I use a hole punch to cut a small circle from the center of each paper. That makes popping the paper out with the tip of my snips quite easy. I leave my basting stitches in place. I find two quick stitches on each corner goes quite a bit faster than stitching thru the papers. Not pulling basting threads is a time saver, too. 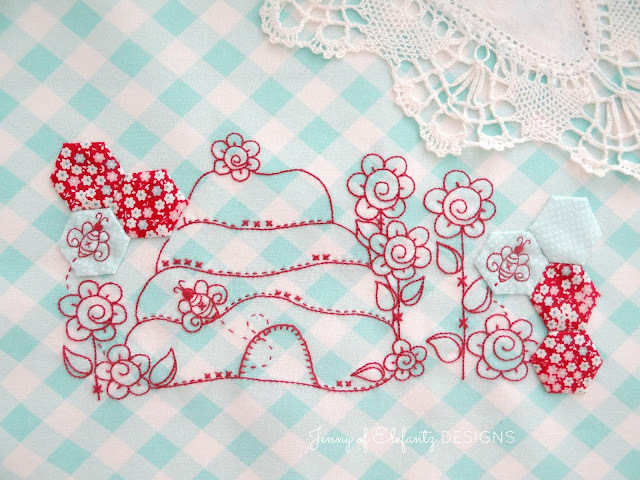 I love all the sweet fabrics you use! Yes Jenny my home town where I was born still pulls at my heart, I tell myself I would live there again, but really I live where my heart is happy and that is where my husband is. There is some something so relaxing about English paper piecing. Hope Hannah sees this post. She has a long term quilt project for hexi's but I don't think she has done any for a while. The little town sounds wonderful. The cottage looks lovely too. 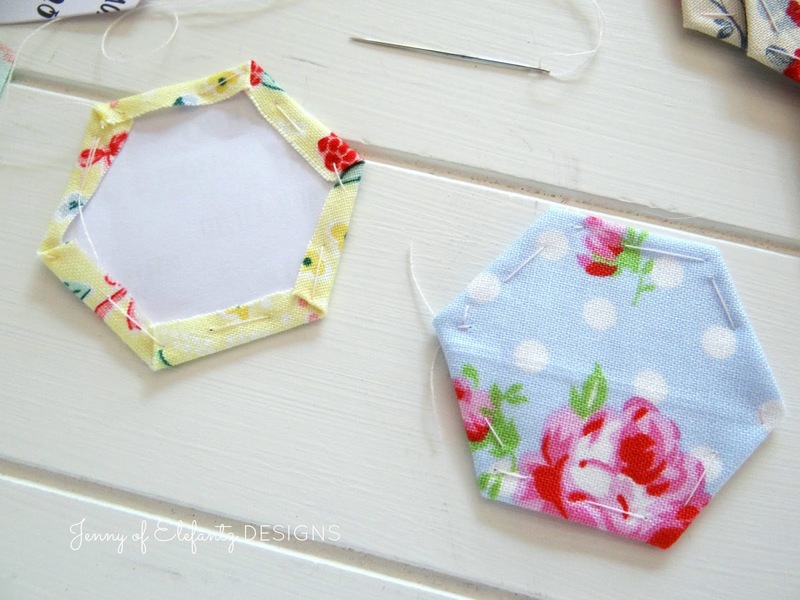 Your hexi flowers look wonderful. Dear Jenny, Jim talks of going back to the town he met me in some. It is my home town. In the 38 years we have been away from it it has changed and I think I see the changes more than he does when we go back to visit family. It has grown so much I don't think it would be the same as he remembers but he wants smaller than Dallas/Ft. Worth. When push came to shove though I don't think he would ever move since this is where the grandchildren are. 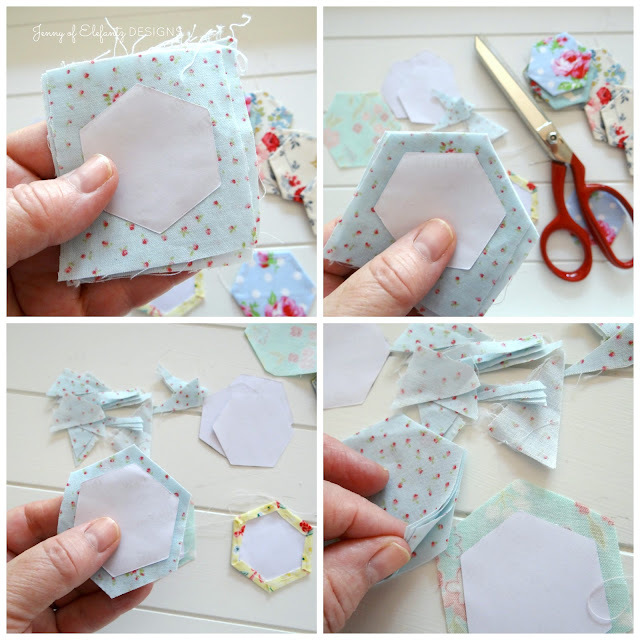 I haven't done hexies but they have been on my bucket list. I even went so far as BUYING some pre-cut papers. I have plenty of patterns to make my own in any size I could want but I actually bought some pre-made ones, what was I thinking???!!! You have inspired me. Right now Jim is on a business trip that is more a vacation. Each time he has called to check in he has caught me doing a household chore. I am blessed beyond measure to be able to have the life I do. The only break in routine I have had since our trip to New England several years ago has been my two back surgeries. They were not exactly vacations. This hit Jim when he called Sunday night after being out for the evening on the ocean on a "pirate" ship. I have now been promised a real vacation next winter and something small soon. I think I am going to start experimenting with hexies so I will have something to do when we go. Thank you so much sweet one, this was a timely post. I have to have something going on with my hands when I am sitting. Have a wonderful day. I'm SO glad you had a wonderful getaway day. Yes, I have a place where I would definitely be living if I could. =) I hope at just the right time that house you like will be for sale, a job will turn up, and your special hopes will be fulfilled. We can withstand much more when we are in a place that comforts our hearts. You do the basting exactly the way I've done it for years and years. I have experimented with glue-basting, and there's only one glue pen I will use, normally on the larger hexagons, because the small ones are so easy and quick with needle and thread. Thanks for the wonderful hexagon practice piece. That would have so many possible uses. Enjoy your upcoming longer trip. Jenny I cut out some EPP shapes yesterday and stitched them (no glue) and I agree it is very relaxing. One day soon I will stitch them together. They are not hexies but a bow tie BOM I saw on internet and trying out. It is relaxing and easier to sew then embroidery when you need to concentrate on the TV or other and as you said a great project for car travel as so mobile. Unfortunately my husband and I haven't done a road trip in Australia for so long now but I love it when I used to find craft magazines for sale for a couple of dollars as you say. Hmmm perhaps it is time to take a trip to a small town to find some booty. Love hearing about your road trips Jenny. They sound so nice. Enjoy next weekend and travel safely. Thanks for another lovely blog. I don't know what I would do without reading your blogs and sewing your designs. Thank you for giving so much of yourself to us readers. Hope your dreams are fulfilled soon. Jenny I do believe Charters Towers has stolen your heart forever my dear. I so wish you could find your husband a position there so you could move back...Love, love, love the cottage.....I yearn for a simpler life have for years....It sounds like a absolutely wonderful location to live....I will pray that your dreams come true for you and Mr. E very soon. Thank you for sharing your journey with us, and thank you for your lovely pattern. There's a very small beach town up north where I lost my heart as a child - I'd love to live there, but they get longer winters that we get down here, so a summer cottage would be lovely, lol. 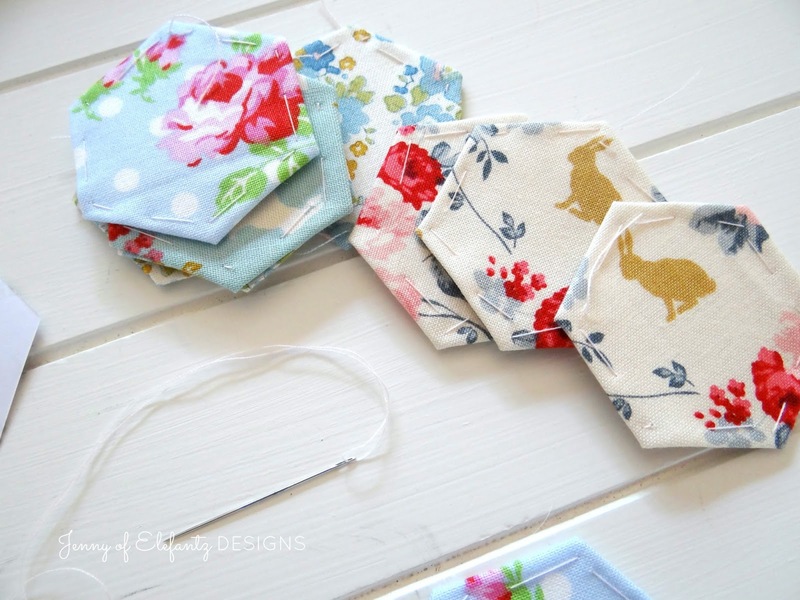 Pretty hexies!!!!! Your time in Charter Towers sounds like a lovely little getaway. When I baste hexies I do it on the wrong side, with no stitches going through the paper and I never pull my basting stitches out. Each corner gets a little stitch. Looking forward to seeing what you'll do with your hexies. Mine is an ongoing forever project, I think. How lucky you are to be able to still visit Charters Towers. It really is a lovely place. Enjoy playing with your hexies. The colours play so well together.